Formed in 1763 NH - 1772 NY. 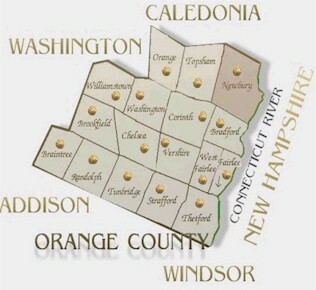 This is a beautiful town on the west side of Connecticut River, and supplied with mill privileges by Wells River, and Hariman’s and Hill’s Brooks. These brooks have their sources in ponds of considerable size. 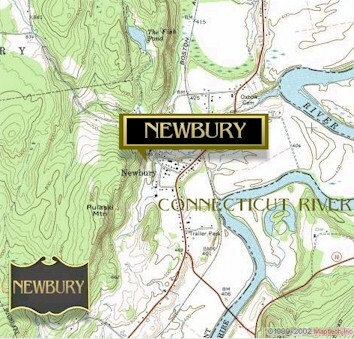 Newbury comprises the tract commonly called the Great Oxbow, on a bend in Connecticut River. This tract is of great extent, and celebrated for its luxuriance and beauty. The agricultural productions of the town are very valuable, consisting of beef cattle, wool, and all the varieties of the dairy. The town contains a number of mineral springs, of some celebrity in scrofulous and cutaneous complaints. The villages of Newbury and Wells River are very pleasant; they command a flourishing trade, and contain manufacturing establishments of various kinds. Some of the buildings are very handsome. The scenery of the windings of the river through this fine tract of alluvial meadow, contrasted with the abrupt acclivities in the north part of the town, is very striking and beautiful. The town is connected with Haverhil, N.H. by two bridges. Newbury village is the site of a well conducted seminary, under the patronage of the Methodist Episcopal Church; but it is open to all denominations. Boundaires. North by Ryegate, east by Connecticut River, which separates it from Haverhill, N.H., south by Bradford, and west by Topsham. First Settlers. The settlement of this township was commenced in the spring of 1762. The first family was that of Samuel Sleeper. The next were the families of Thomas and Richard Chamberlain. John Hazleton also moved his family to Newbury in 1762, and his daughter Betsey, born in 1763, was the first child born in town. Jacob Bailey Chamberlain, son of Thomas C., born the same year, was the first male child. The parents of the latter received a bounty of 100 acres of land, agreeably to a promise of the proprietors of the township. Among the first settlers, in addition to the above, may be mentioned Gen. Jacob Bayley, Col. Jacob Ken, Col. Thomas Johnson, John Taplin, Noah and Ebenezer White, Frye Bayley, and James Abbott. First Minister. The Congregational Church of this town was formed at Hollis, Mass., in September, 1764. The Rev. Peter Powers, the first minister of Newbury was installed over this church, Feb. 27, 1765, and he preached his own installation sermon. Distances. Twenty-seven miles south-east from Montpelier, and twenty north-east from Chelsea. The Connecticut River Railroad passes through this town. please contact the Orange County Coordinator. Part of the USGen Web Project.